Clark Kent (Christopher Reeve) returns to his hometown of Smallville for his high school reunion. While there, he reconnects with his childhood crush, Lana Lang (Annette O'Toole), and starts to build a relationship with her. Meanwhile, a maniacal business man named Ross Webster (Robert Vaughn) enlists the help of a computer programmer named Gus Gorman (Richard Pryor) to hack into government computers to create chaos and corner different commodities markets. This is where it all started to go downhill for the man of steel. 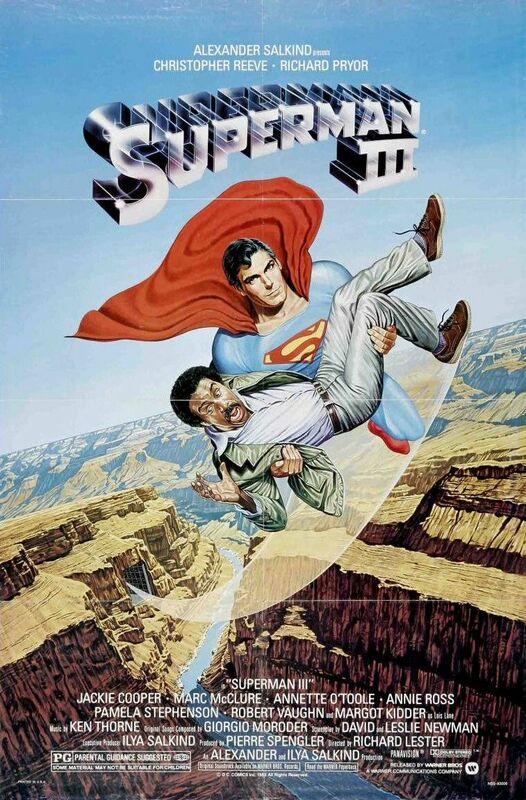 Richard Lester returns to the director's seat for "Superman III." This is the first movie in the "Superman" series to have zero involvement from Richard Donner, and it certainly shows in more ways than one. From the minute the opening credits roll, you can tell their has been a drastic tonal shift from epic superhero adventure to something much more lighthearted and campy, even borderline ridiculous. The entire opening credit roll is a series of slapstick gags rapidly fired at the audience one after the other as Clark Kent walks to work. People slip, fall, get hit with pies and paint, fall down manholes, you name it. If you weren't exactly sure by the time the blurry credits ended, it was more comedic than serious, and it's also completely unnecessary. We also find out relatively soon that comedian Richard Prior has been added to the cast as an unemployed Gus Gorman on the government dole to a would-be computer programmer. Apparently Gorman is capable of hacking government satellites after just one computer class. Who knew it was so easy! Though Richard Prior is funny, as he always was, his whole involvement in "Superman III" is almost wholly out of place as this reluctant villain. We're not exactly sure how or why he got involved, but we believe the paycheck had something to do with it. Of course, Christopher Reeve returns as the titular Superman, and he still owns the role even in a mediocre film. Though Margot Kidder returns as Lois Lane, her part has been cut down to about 12 lines because he has a new woman in his life, apparently. The new woman, well, the woman from the past in Superman's life is his childhood crush and single mother Lana Lang, played by Annette O'Toole. She and Reeve do manage to have good chemistry on screen. In the villain area, Lex Luthor is gone and has been replaced by Ross Webster, played by Robert Vaughn. Webster is a rich businessman who is only interested in getting richer, and he will stop at nothing to make it happen. This third installment is the movie that marked the beginning of the end for the Superman series as it was. It was a clear sign they didn't know where filmmakers were going with the character and the beginning of the descent into treating the man of steel as a cartoon rather than a serious hero. This movie is not the worst film ever made, but it really needed some dazzling. It's cool to see Superman go back to his childhood home and rekindle his connection with Lana Lang, but it's not enough to carry the entire film on its own. The villain isn't exactly perfect here, either. In the end it isn't the worst superhero film, but it isn't exactly good either. It's sort of a letdown all things considered. One year ago, we were watching: "Monty Python's The Meaning of Life"